By refusing to allow nangai nuts into the EU. These are a delicacy that grow wild in Vanuatu in particular, but also in PNG and the Solomons. 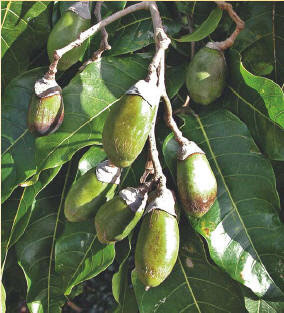 A Vanuatuan spice exporter has a run down: "Indeed, the businessman believes the nuts, otherwise known as canarium indicum, is the most lucrative crop in Vanuatu...Spending over a quarter of his life on studying the nuts, figures fall off Wah's mouth easily. Fully exploited, the man believes the nuts can employ up to 100,000 people, that's just about half of Vanuatu's population!...prices hovering at around A$5000 a tonne". "An additional assessment was carried out in accordance with Article 7 of the Regulation. The Scientific Committee for Food adopted an opinion on 8 March 2000, which stated that data necessary for the assessment of the safety of the product are lacking. Therefore the product should not be authorised". Our own dear MAFF (as was) decided to copy the French: "The Committee considered the summary application and assessment report from the French Competent Authority. The Committee considered that the information available was insufficient in a number of areas to recommend approval. In particular more toxicological data was required along with data, on the potential allergenicity, given that other members of this nut family can give rise to contact dermatitis and allergic reactions". Never mind that research has shown that "those with nut allergies can enjoy nangai" , or that the USA, Australia and Japan - inter alia - with their shockingly poor standards of food approval and the like allow the sale of these nuts. I am, of course, itching to try a nangai nut or two, and thus I damn the EU's Novel food regulations for preventing me from doing so, but more importantly for limiting the ability of Pacific islanders to make a half-way decent living. Meanwhile, the Food Commissars have approved the following, "‘maize-germ oil high in unsaponifiable matter’, 'foods and food ingredients derived from genetically modified maize line MON 863', 'yellow fat spreads, milk based fruit drinks, yoghurt type products and cheese type products with added phytosterols/phytostanols' etc etc. This entry was posted on Tuesday, January 15, 2008 at 8:34 am. You can skip to the end and leave a response. I thought things were generally legal unless banned - are these nuts illegal in the UK?